Looking to spend some special time with your very own Miss Dyngus 2018? Consider spending the night at our Partner A-Loft Cleveland Hotel Downtown. Use special code DD02AA on the night of Dyngus Day and enjoy the festivities even more! 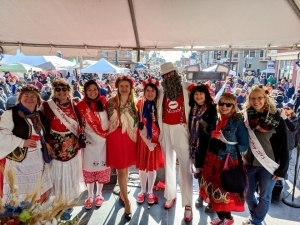 Looking to become Miss Dyngus Day 2019??? Submit the application below! Na Zdrowie! Fill out our Miss Dyngus Application. lives in Akron with 3 cats, Larry, Curly, and Moe. They could care less that I won Miss Dyngus, however, my family and friends couldn’t be happier. My grandma messaged me and said, “I’m Sure Gpa Ryba is doing the Polka and letting everyone in Heaven know our Wonderful news…” I want to keep his memory alive by remembering and celebrating where he came from. 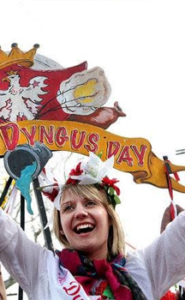 What better way than being a part of Dyngus Day, and now all Dyngus Days to come?! I can even spread some Polish pride to Akron! I’d like to thank DJ Kishka, the Dyngus Day Committee, and everyone else who makes this Holiday so special! I also would like to thank my personal Dyngus Squad; including my sister and Aunt Leanne for getting me in my best polka shape, my Uncle Dave for quizzing me on polish trivia, and my parents (and Danny Grompson-ski) for pushing my dupa in the Miss Dyngus float in the parade! This was the best thing that has ever happened to me in my three decades on this planet! Oompa! is having so much FUN being Miss Dyngus Day Cleveland 2017 (MDDC 2017) and would like to thank DJ Kishka & family, all the friends who helped me get ready for this special day, the 30,000+ Dyngus Day party visitors, pageant contestants, restaurant and bar personnel, musicians, volunteers, Police/Fire/Emergency service folks, and all those who look forward to celebrating Dyngus Day! What a wonderful FUN, safe time in Cleveland! Plus, a big shout out to my family-living in the Chicago area. Since coming to Ohio – about 20 years ago, I’ve lived in Cleveland, Streetsboro, and now reside in Bedford – and presently running for Ward 3 City Council in historical Bedford. You can also find me during my MDDC 2017 term attending numerous festivals and events helping to promote my Polish culture, other international groups, the City of Cleveland, Parma, Slavic Village, and Bedford. Being 100% Polish and proud of it – especially with a name like KARABOWICZ – I love to tell everyone that I am Polish, Catholic, blonde and blue eyed – what a combination—Woohoo!…This Polish girl enjoys making Pierogi and other Polish foods taught by my Mom and family. Wigilia and Easter blessing of the basket are traditional Polish holidays that represent my culture and are extremely important traditions that are continued to preserve my heritage. And what happens when a Polka is played? You’ll find me dancing in my seat, singing along, or getting out to Polka! Polka music has always made me happy and reminds me of my Dad. I look forward to listening to Polka music on Saturday morning and Sunday afternoons on the Cleveland radio and those that know me – I really like to “crank up” my Polka stations! Woohoo! It is so much FUN being MDDC 2017! It truly is an honor to receive this title; I was totally surprised, touched, and humbled by all those who yelled, screamed, whistled, sprayed me with water, provided congratulatory and complimentary remarks, snapped photographs together, posted videos on YouTube and provided me the opportunity to be your Miss Dyngus Day Cleveland 2017. 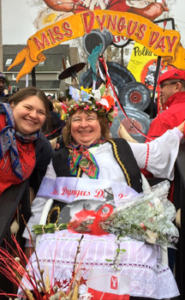 I’m looking forward to having FUN for the remainder of my term and seeing everyone on the next Dyngus Day – April 02, 2018 – Woohoo! Dziekuje! 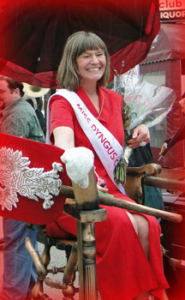 Michelle LoBuglio – don’t let the name fool you, loves the honor of being Miss Dyngus Day 2016. Her Grandma and Grandpa both emigrated from Poland in the early 1900’s. Although she loves pierogis and piwo, she loves to polka the best. “I grew up with the Sunday morning show, Polka Varieties. It was on every Sunday morning after we returned from Mass. I would stand on my Dad’s feet and we would dance around the living room together. We have taken that dance as a tradition in weddings for our family. On my wedding day our Father-Daughter dance was the craziest Polka I have ever danced, and my Dad kept saying, “Just hold on Honey, I won’t let you fall”. My husband, Ed and I agreed the key to a successful marriage started out with the agreement that he had to learn to polka and I had to learn how to make his mother’s Italian spaghetti sauce. It has been the best deal ever, since we are about to celebrate our 35th anniversary”. But the tradition of the Polka has expanded to the next generation as well for when Michelle’s oldest son danced with his mom on his wedding day it was also to the tune of a polka. Michelle hopes that every time she dances a polka her dad in heaven is tapping his feet to the beat. I grew up in Parma and currently reside in Sagamore Hills with my husband, Brandon. I am a nurse at Rainbow Babies and Children’s Hospital. My great-grandparents on my mom’s side of the family (Baba and Dedo) actually came over to America from Poland and met here in the US at a Polish Dancehall. So many of our family traditions involve polish food and music. I grew up listening to my parents playing polka music all the time (my dad even exercises to polka music!). We are not shy around a dance floor when polka music plays at our family weddings! My favorite is all the delicious polish food… Nothing beats a good pierogi! I was so ecstatic to win Ms. Dyngus 2015, and I know it made my parents so proud. Kim has played a key roll in bringing polish tradition and polka music back into her family. Last Easter Kim and her husband, Jonathan had the entire family dancing to polka music while sipping cytrynówka. Kim and Jonathan traveled to Poland on their first wedding anniversary to prepare for the 2014 Ms. Dyngus Day pageant. 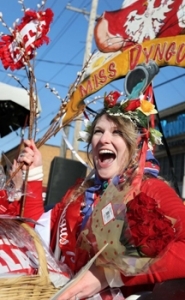 Her family has always referred to her as the Polka Princess, and being crowned Ms. Dyngus proves it. She couldn’t be more proud when her nephew calls her Auntie Dyngus. Kim’s favorite polka is Hoop Dee-Doo because the lyrics “I hear a polka and my troubles are through” couldn’t be more true. When asked what drew her to apply for Ms. Dyngus, she knew it would be great fun and would make her grandparents, Walter and Julia Zurowski, smile up in heaven. Her qualifications include, but are not limited to, pierogi & borscht making, polka dancing, and let’s face it; she looks damn good in a babushka. With the help of her family, they make over 500 pierogi each fall just in time to eat for wigilia. When she isn’t pinching pierogis, you may find her practicing her lines for next years How the Kishka Saved Christmas performance, spending time with her husband and their little golumpki (aka her children), running, or drinking piwo. 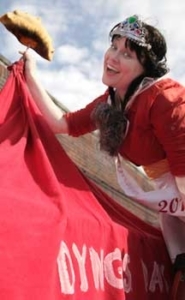 DeAnna Domino-Sierputowski won the 2012 crown with her campaign slogan “A pierogi in every pot and a polka in every heart.” She is Cleveland born and bred, and currently resides in Tremont with her Polish Prince, Jeffrey Sierputowski, and their polka loving cats. She believes polka makes everything more fun, even cleaning! It would be rare to catch her scrubbing the toilet without a polka record playing. 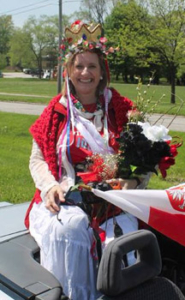 Her travels through Poland are some of her most cherished memories, though even that pales in comparison to the Dyngus Day crowning ceremonies. It was a proud moment for both her and her Polish family when she won the 2012 title. Her favorite polka is, and always will be, Ice Cubes and Beer. 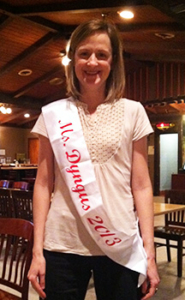 The inaugural Miss Dyngus 2011 is Eugenia “Chi Chi” Gorski. Born and raised in Cleveland, she has been making pierogi since birth! She also holds the world record for the fastest polka ever at 78 revolutions per minute!